There are very few vehicles like this available on the market, and most multi axle vehicles like this are custom builds, something I don’t think I am capable of personally. So i’d get something like this if I was given the chance! Perhaps unsurprisingly Vaterra has released details of an RTR version of their Ascender after releasing it as a kit earlier this year, in fact the very first kit from Vaterra. 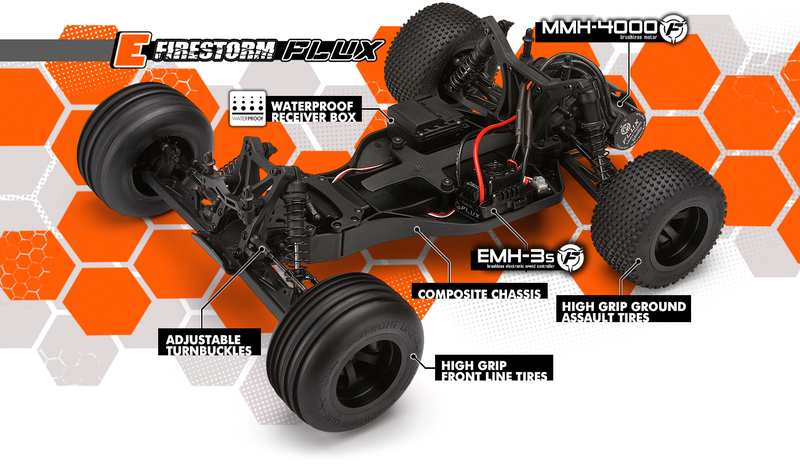 It looks like having a list price of around $400 US and for that you get the same metal ladder frame chassis, a metal gear single speed transmission, CV front shafts, a painted K5 Blazer Body, Waterproof Dynamite electronics, 35t brushed motor, Spektrum DX2E radio and Interco TSL SX Super Swamper® tires. 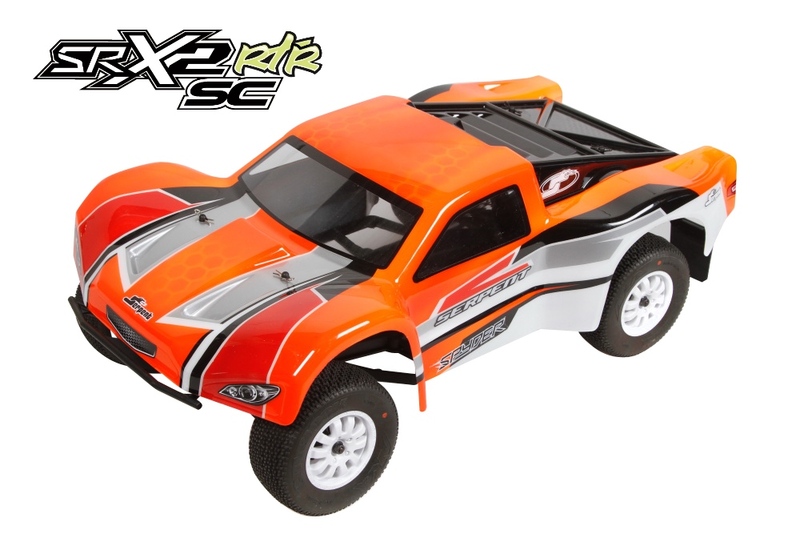 A pretty good deal to my mind, and it looks to be price competitive with the SCX10 line of vehicles on price at least. With the support of Chilli FM, Action R/C, Trophy Traders, Hot Toddy’s Heater Installs and Pabs Discount Car Parts, innovative R/C motorsports club Launceston R/C hosted the highly successful Chilli FM Launceston R/C Cup in early October 2014. Now featuring a fully carpeted off road layout at our venue in the Uniquely Tasmanian Pavilion at Quercus Rural Youth Park, Carrick. 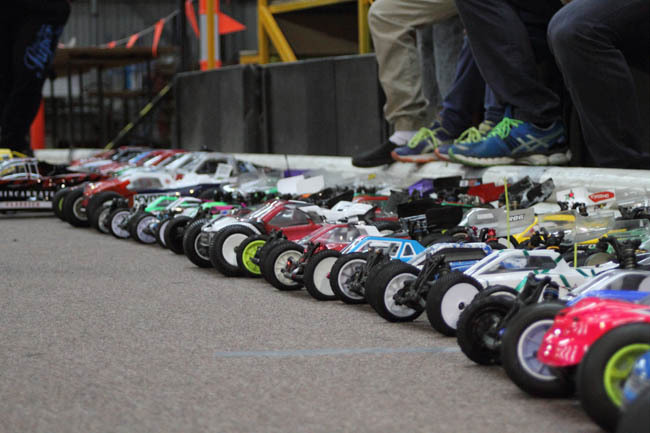 Tasmania’s R/C racers responded incredibly, with a Launceston R/C record of 105 entries making it the most successful event in the four year history of this Annual event. Members from all Off Road Clubs around the state attended the event and took part in some incredibly competitive racing, amazing camaraderie, fantastic atmosphere, great coffee from Bump ‘N’ Grind Coffee and the mouth watering hamburgers from Burger Junkie. There was strong entries across all of the classes with two heats being run in 4wd Modified Buggy, 2wd Buggy Stock, Stadium Truck Stock, and three rounds in 2wd Short Course Truck Stock. Launceston R/C is very thankful for the support of all it’s supporters, together with our other event sponsors in putting together this fantastic event. We’re looking forward to even bigger and better things in 2014. All photos of the two days can be found here for Saturday, and here for Sunday. Other upcoming events in Tasmania are the Goodwood Cup this weekend in Hobart, and the Latrobe Cup near Devonport on the 6th and 7th of December. I have to say, after handling a Gelande 2 for the first time the other week, and looking at the first impressions of the Ascender, I am seriously thinking of getting a crawler, anybody got a spare one for me? Anyway, have a read of RC Car Action’s first impressions here on their website http://www.rccaraction.com/blog/2014/10/28/kevs-bench-vaterra-ascender-sneak-peak/ . Another impressive vehicle from industry newcomers Vaterra. However as sneak peeks go it’s a good one, so I’m reproducing it below, remember copyright belongs to Radio Control Car Action. The Ascender is the latest vehicle to come out of the Vaterra Garage and like others before it’s very well detailed and is a performer. 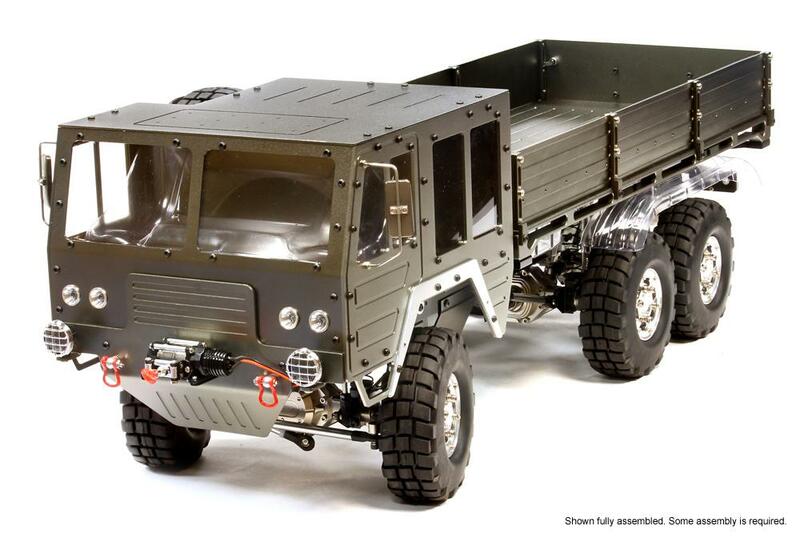 This scale truck is the only Vaterra model to be released exclusively as a kit. I just finished putting together my Ascender and am working on a review for the February 2015 issue of Radio Control Car Action Magazine. Here’s a sneak peak of the truck and some first impressions. The stamped steel ladder frame chassis and suspension are unique. 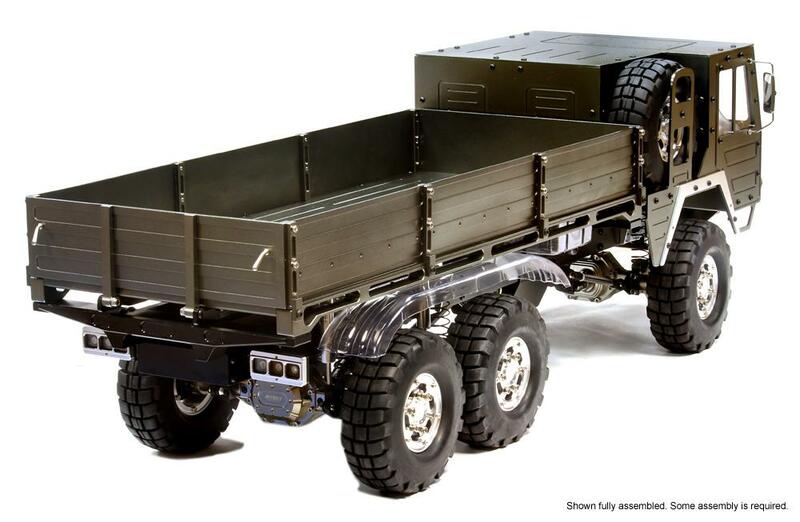 They are designed to allow for major wheelbase changes that will let you put just about any body that is available on it and it will change how the truck performs. The frame members are channeled and the thickness of the front rails are slightly smaller than the ones used in the rear and this allows the front to slide into the rear. All the hex screws that are used to assemble the chassis pass through the rails and thread into plastic cross members. Check out those tires! They are scale replicas of Interco Super Swampers and come with foam inserts to support the rubber. They sure do look good and I am sure that they will find their way onto custom projects everywhere. The included 1.9 inch wheels are chrome plated and the tires are glued to them. Chrome plating can be found in the bead area and I recommend that you remove it before gluing for a better bond between the tire and rim. The rear suspension is your typical 4-link deal. See the spacers on the links? That is part of the changeable wheelbase. The drive hexes are standard-size at 12mm, so there are endless wheel options for the Ascender. Inside the axle you will find a one piece spool/gear that is unlike other trucks where the gear is screwed onto the spool. The rear axle use a straight shaft to get the power to the wheels while the front has universals to do the job. The front end suspension features a 3-link setup with a panhard bar. The shocks are molded out of plastic and smoother than some aluminum shocks that I have run in the past. The shocks are 108mm long (from mounting screw to mounting screw), have a body diameter of 11mm and 3mm diameter shafts for scale appearance. Having the servo mounted in the chassis gets it out of harm’s way but having it there does move the tires slightly through the linkage when the suspension is compressed and extended. The transmission is packed full of metal gears and it can be modified to become a 2-speed. There’s even room and mounting holes on top of the housing for a shifting servo. The transmission was easy to assemble and felt very smooth once complete. A slipper clutch is used to protect the gears and driveshafts when put into high stress situations and needs to be set at 6 turns out instead of the kit recommended 5. Out of the box the single-speed transmission is geared for torque and delivers a top speed of about 3MPH with the 35 turn motor that I installed. The battery is securely fastened to a floating battery tray. The rear of the tray pivots on bushings (circled) while the front is attached to the front axle and moves with it (as arrowed). This allows the tray to be mounted as low as possible and it puts more weight on the front axle which will increase the traction of the front tires. Look at how much steering you get out of the hubs on the front axle. This truck easily has the most steering throw available in the 1/10-scale trail truck class. Yes, all that travel can be used. The servo is mounted on the left side of the chassis and the right side is left open for anyone who wants to build and use their own winch servo. Vaterra includes a very well detailed 1986 Chevy Blazer body with the truck. Great stickers and an injection molded grill really add to the look. The body is however about an inch or more wider than your average scale crawler. Combine that extra Lexan and the injection molded grill and you have a pretty heavy body. For the full review and to see how the truck performs you’ll have to wait for the Febuary 2015 issue of Radio Control Car Action Magazine to hit the news stands. So far, the Vaterra Ascender does not disappoint. The RTR version of the Serpent Spyder SCT has launched and it is loaded with features including spring steel transmission components, 12mm big bore shocks, hard composite shock towers, wide side guards long throw suspension arms, a narrow chassis and a gear diff. 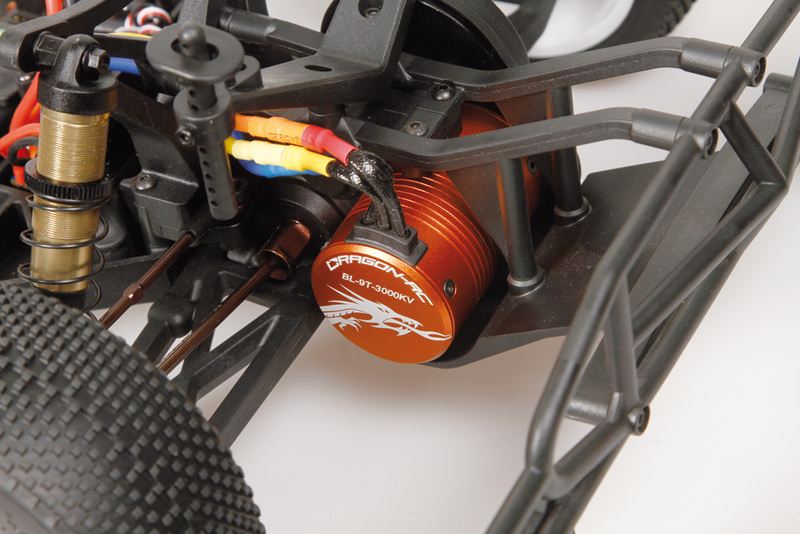 In the electronics package it packs a Dragon-RC sensorless 9T motor coupled with a 45A esc, Dragon-RC 2.4GHz radio with 10 model memory and it comes topped off with a sharp looking prepainted body. Stadium Trucks are a category I love despite not currently owning one. My favourite, and one that has sat on my shelf in the past, is the HPI E-Firestorm, and for 2014 they have given it a bit of a makeover. 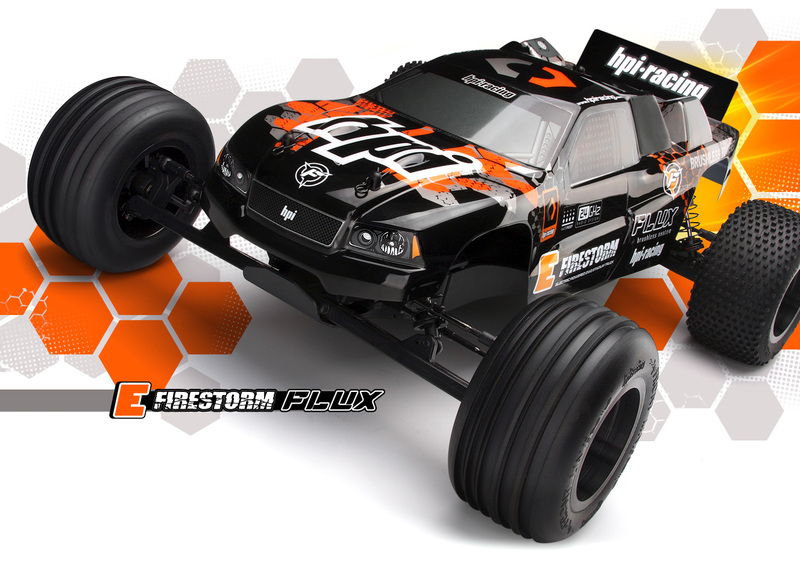 The Firestorm started out as the Firestorm 10T RTR, a 2wd, Nitro Stadium truck designed by Erik Shauver at HPI. 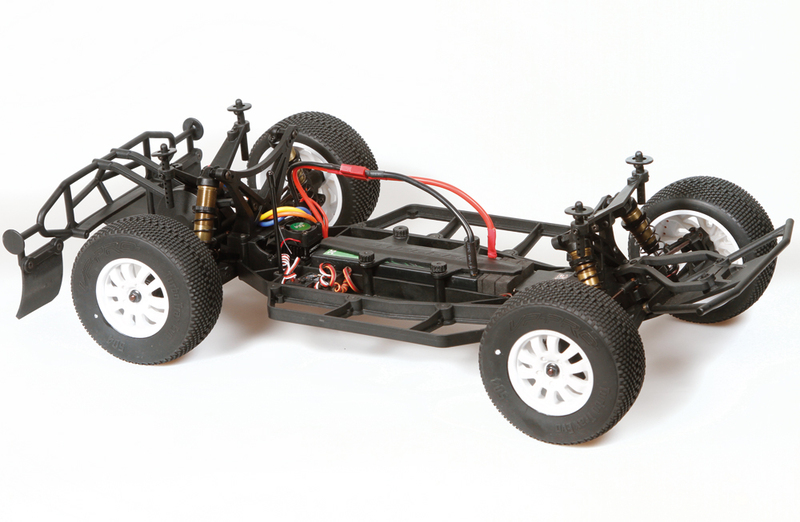 If you look at the 10T here http://www.hpiracing.com/en/kit/10511 you will see many parts the same as the later E-Firestom, but with an alloy chassis and mid mounted gearbox. One does wonder if these parts could be adapted to make an electric, mid engined stadium truck, I never thought about that before today! 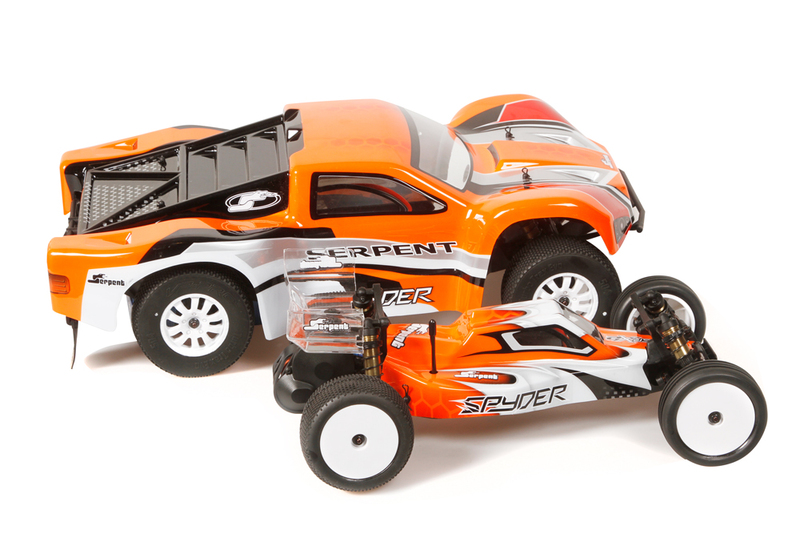 At the same time, the E-firestorm 10T RTR was released in Blue and Red (I had the Blue one) http://www.hpiracing.com/en/kit/10551 with 27mhz radio, 15t Brushed motor and basic SC15 speed controller fitted to a composite chassis, and well most of the other parts from it’s nitro brother. Later came the E-Firestorm Flux http://www.hpiracing.com/en/kit/10554 with chrome wheels, a new paint scheme, and importantly a 5700kv brushless motor and Moviv SEC (both of which were rebadged Castle items, not a bad thing). The ESC could cope with 2s lipo, and had the appropriate Low Voltage Cutoff. The only downside, still a 27 mhz radio. Next came the waterproof versions in Brushed (http://www.hpiracing.com/en/kit/105845) and Brushless (http://www.hpiracing.com/en/kit/105879) versions featuring a waterproof receiver box and ESC, another new colour scheme and finally a 2.4 ghz radio! Interestingly the Flux brushless version changed to a 4800 kv motor as it was reported that the 5700 got to some pretty stellar temeratures, and having a Mamba max and 5700 in my original E-Firestorm I can vouch that was the case. Gearing never changed particularly I believe because to date only one spur gear was available for the E-firestorm. The flux now could take a 3s lipo as well, and may have been part of the reason for the lower KV motor. Enough reminiscing, what about the latest version for 2014? Well a new paint scheme featuring more black with orange highlights that HPI seems to be favoring this year. The big change is a new EMH-3s speed controller and MMH-4000 motor that is again a step down to 4000kv. Another new addition is an included speed pack featuring a wheely bar, a 3s lipo battery strap (taller) and a 77-tooth spur gear and 35-tooth pinion for insane top speeds. Also a new 2.4 ghz radio is included in what is a good looking package, it makes me want to buy one again!